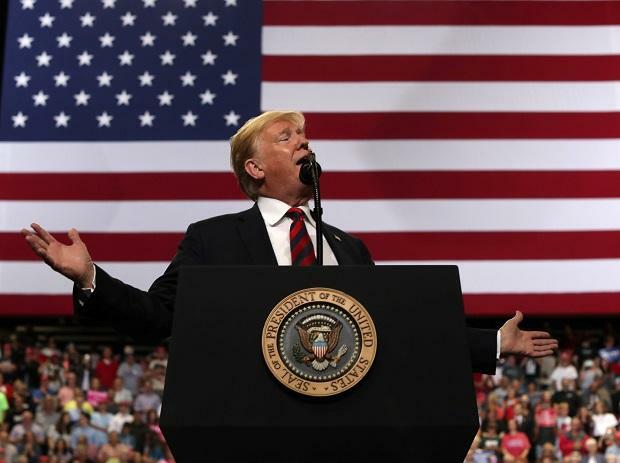 President Donald Trump made a last-ditch effort to retain majority in the US House of Representatives as he appealed to his supporters across the country to "get out and vote" for his Republican party in the crucial mid-term polls on Tuesday which will decide the balance of powers in the Congress over the next two years. US House of Representatives similar to India's Lok Sabha has 435 seats, of which the Republicans in the current Congress has 235 seats and the Democrats have 193. There is a great electricity in the air. I don't know if you report it that way, but there's a great electricity in the air, like we haven't seen, in my opinion, since the 2016 election, he said. At the same time, Trump pointed that the president's party normally does not do well in the mid-term. I think we're going to do very well in the House. If you look, over a hundred years, for whatever reason, the party with the president doesn't do very well. I think we're going to do pretty well, he said. We'll just have to work a little bit differently. It'll all work out. But I don't think that's going to happen. I think we're doing very well in the House. I think we're doing very well in the Senate. There is something going on. I'm just telling you, he said referring to the large crowd he addressed in Ohio. The Democrat agenda will deliver a socialist nightmare. It's what it is. The Republican agenda is delivering the American dream, he said. The party's 55 per cent to 42 per cent advantage in the new poll mirrors their lead in early October and is about the same as the 10-point edge they held just after Labor Day.